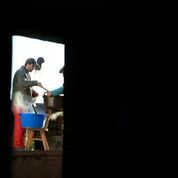 THE HIRED BAND had already packed up after playing at fašiangy, the celebration before the beginning of Lent. Young musicians had taken over for the after party; the number of songs they knew was impressive. Everyone over the age of 30 was starting to look rather lethargic, but the young people played on. Even my own love of music wasn’t holding up to the late hour. 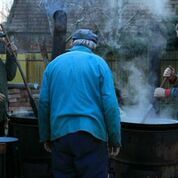 Sunday soup is a weekly tradition so ingrained in Slovak culture that a young man thinks of it while merry making in the wee hours of the morning. Sunday lunch starts with this soup, as well as any celebration involving a sit-down meal – weddings, birthdays, Christmas, Easter. Bones of any kind (but often chicken) are slowly simmered with vegetables for at least three hours (hence needing to wake up early) to produce a sweetish clear broth, served with thin egg noodles and soft carrots. A smattering of Vegeta, dried vegetable seasoning, and parsley adds to the characteristic taste. Sunday soup is just one example of the Slovak obsession with flavour-rich hot broths. In fact, every lunch meal begins with soup, whether in school cafeterias, restaurants, or at home. The type of soup varies – creamy soups, ‘clear’ vegetable soups, or legume soups to list a few – but the majority precede the main meal. I have a number of theories of why soup is such an important part of Slovak food culture. Soup made with stock from bones gets the gastric juices going and actually helps digestion of the lunch that follows. In fact, bone broth has been in the limelight recently for its healing properties, from helping fix leaky gut to healthy smooth skin. And, to boot, it makes any soup taste amazing. When most of your food comes from your backyard, as was true in Slovakia until recently, you use every single part, including the bones and organs, to get the most nourishment out of the animal you worked hard to raise. Soup is also a cheap way to fill up. 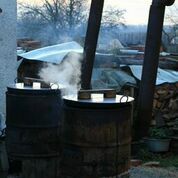 Between two world wars and communism during the last century in Slovakia, food was often scarce. When I asked my mother in law what a classic Slovak soup was, she immediately thought of egg drop and caraway soup, and I got the impression that this was a good soup to fill up on when there wasn’t much else. Then there are the meal soups and stews. These hearty dishes are perfect for feeding a large group of people, much like one might cook chili or beef stew to feed a crowd. Goulash, while originally Hungarian, is a staple in Slovakia and can be seen around the country simmering in large cauldrons outside. There are even goulash cooking competitions. Another favourite is kapustinca, sauerkraut soup with different kinds of meat, or segedínsky guláš, a creamy paprika stew made with sauerkraut. Sauerkraut, fermented with salt, was a way to eat vegetables through the winter; it’s an amazing source of probiotics and contains even more vitamin C than fresh cabbage! Curious about the Slovak soup culture, I set out to gather soup and stew recipes, which resulted in the ebook A Bowl of Comfort: Slovak Soups & Stews. 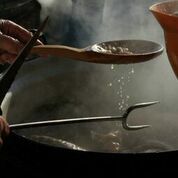 Included are “normal” recipes, like cream of garlic soup and barley and ham soup, and more adventurous ones, like beef tripe soup and whey soup. There is also a whole chapter devoted to the amazing properties of bone broth! Recipes for some basics, like homemade Vegeta and a couple kinds of soup dumplings. And, on top of that, all the recipes are gluten-free or have gluten-free alternatives. In the book, you can get a peak into everyday Slovak life through soups, something most Slovaks take for granted but miss when it’s gone. But there’s something else too. The book whets your appetite not just for tasting proper, tradition-steeped Slovak food, but for getting away from the big cities out into the countryside: where Slovakia’s heart surely lies. Naomi Hužovičová writes about life in Slovakia as a Canadian on her blog, Almost Bananas, especially the food, culture, and places. It’s been a long time in coming but here, after much consideration, is my top ten of quintessential Slovak foods/drinks. I use the word quintessential to convey unique or semi-unique to Slovakia culinary delights, so these are ranked with uniqueness as well as tastiness in mind. I am quite sure those familiar with Poland and the Czech Republic will pipe up, incensed, at a few of these being labelled Slovak foods but with this part of Europe, which has changed borders with quite a high frequency over the last few centuries, of course culinary traditions mix and merge. So the most justifiable claimant to a lot of these Eastern European specialities is the region, not any one country. Of course there has to be a top ten entry for perhaps Slovakia’s most famous food/drink export, slivovica. This plum brandy is so Slovak – you imagine the old man picking the plums and doing the home distillation as you drink a glass of this fiery brew (perfect at 52%). Whilst it’s a thing other countries including Serbia and Czech Republic can rightly claim to do as well, this is still an ultra-traditional Slovak drink. Get the home-brewed stuff: it’s almost always better than the shop brands – but also significantly stronger. Basically: a poppy seed-filled strudel, only with a thicker pastry. Absolutely delicious. Slovaks use poppy seeds in a lot of sweet things. It’s right up there with apple as a flavour for dessert. Some of the best makovnik I had in Slovakia was actually at the spa in Piešťany. Going strong since the 1950s, the classic horalky is – well – a wafer bar. A sandwich of wafer with layers of either chocolate, hazelnuts or peanuts that for some reason Slovaks and Czechs kept to themselves for a very long time. If you’re going on a picnic, take one. This is the soft drink generations of Slovaks grew up on. Czechs have it too, but it’s Slovakia which seems to cling to kofola with the warmest nostalgia. Remember, everyone, that once Coca Cola wasn’t available here:if you wanted your carbonated drink fix kofola was it: it comes in various flavours, like cherry and looks and tastes quite similar to Coca Cola, i.e. dark, sweet and fizzy (Slovaks would say superior and they may be right – it’s got much less sugar and quite a bit more caffeine and the breadth of flavours makes the kofola world a bit more varied than the Coca Cola world). Licorice is also added to help give it that unique kofola taste. In any case, it’s one of those soft drinks, like Inka Kola in Peru, that manages to rival Coca Cola (in terms of Czech and Slovak sales). You’ll see this as 1-Euro-a-pop snack food at almost any Slovak festival: a bargain! Lokše are basically potato pancakes stuffed with (to have it in its optimum form) goose or duck fat (goose and duck fat, by the way, would be on this list if we were doing a top fifteen or top twenty – Slovaks will often eat the fat by the spoonful with nothing else!). 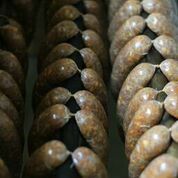 It can be very easy to go wrong with lokše purchasing – so look for the stall with the moistest, greasiest looking ones! (it’s something of an acquired talent – I know Slovaks who will dismiss stall after stall of lokše that all look perfectly OK to me, and then, without any warning, go “ah!” and alight upon a fix of potato and fat goodness. Well, I never claimed that typical Slovak food was healthy. A claim that’s added to by the fact that typical lokše also seem to be brushed with melted butter once they’re stuffed and rolled. This is a complex herbal liqueur cobbled together with 14 different herbs, honey and alcohol – weighing in at 33-38% proof which is admittedly less than slivovica but actually, for me, a much richer drink, with a slightly bitter, aromatic taste. The Czechs do becherovka which is similar and equally tasty but demänovka is Slovak through and through – made near the Low Tatras town of Liptovský Mikulaš. Tragically only one type of dumpling can go on this top ten list although – in terms of the food in the average Slovak stomach – the ratio should probably be a bit higher. The obvious candidate amongst Slovakia’s many different types of dumplings are the halušky – small dumplings made out of a grated potato batter. It’s not just the bryndza (scroll further down this top ten for more on bryndza) which combines with these little gluten-rich balls of delight – oh no – that other usual suspect of Slovak cuisine, cabbage, also gets added on top to make strapačky. You can also add a meat like liver to the dough for something a little different. For outsiders, this is the must-try: a tangy sheep’s cheese that gets used in a huge variety of traditional Slovak meals. For starters, there’s the national dish, brynzové halušky: small potato dumplings in a sauce made with bryndza and topped (as with quite a few Slovak dishes) by bacon. Another classic is the brynzové pirohy – Slovakia’s classic take on the stuffed dumpling also common in Poland. The best place to buy bryndza is NOT in a supermarket but on a salaš – a rural farm, the signs for which are found on country roads all over Western, Central and Eastern Slovakia. Our special guide to the salaš will be available soon – until then you have been warned. Here’s Englishmaninslovakia’s easy bryndza recipe. Austro-Hungarian rulers use to bathe in tokaj (so say some legends) or drink it as medicine (so say others). If you happen to have enough of this delicious amber-coloured wine to bathe in, lucky you. This wine region is in Slovakia’s far south-east next to the border with the Hungarian wine region, Tokaji (see the difference?). There is far, far too much to say about Tokai to fit in this post, so please check out our article on the Slovak Tokaj cellars of Eastern Slovakia, but basically Tokaj has a unique sweet taste because of a controlled rot that is allowed to part-infect the grapes. It’s one of the most singular wines you will ever try – and it’s delicious (I say, sipping a glass as I write this). This delicious soup shoots in at the number one spot for me. It’s got a sauerkraut base, with the taste bolstered by tomatoes, mushrooms, pork sausage (some use a spicy chorizo) and, for Slovak cooking, an incredible amount of seasonings ranging from garlic through to nutmeg and even apple sometimes. Slovaks eat this on New Year’s eve, and sometimes over the entire festive season. There is simply no other typically Slovak dish that can touch it for complexity: kapustnica is to Slovakia what mole is to Mexico! I’ve tried a similar cabbage soup in Poland and it was not anywhere nearly as tasty as those I’ve had in Slovakia (but hey – I don’t want to start a war!). Here’s a link to a good recipe. Slovak cuisine tastebud-tickling time. And this, primarily, for those who have been asking me about classic places to eat really good Slovak food in Bratislava Old Town. On first examination, the question itself appears bizarre – what other kind of food would restaurants in the Slovak capital be serving up? Well, the current trend in the city centre seems to be leaning towards the international=cool approach. But traditional Slovak cuisine? More the domain of the old folks and the tourists (the old folks aren’t so bothered about gourmet, the attitude goes, and the tourists, ha, they can easily be conned into what constitutes good Slovak food), with the result that, outside of a few dingy krčmy (pubs) and a clutch of high-in-price, far-lower-in-quality joints around Hlavné námestie (the main square), really good typical Slovak restaurants are fairly elusive. So, dearth of top-end Slovak cuisine-oriented restaurants revealed, it was both shocking and heartening to discover that one of the very best in Bratislava is actually situated right next to Bratislava Castle. Shocking because who expects a really good showcase for national cuisine right by one of the most touristy spots in the whole country? Heartening because – well – we know that however much we celebrate off-the-beaten-track places on this site, it’s those big attractions where foreign visitors often gravitate and if they do, we would much rather they had the option of seeking refreshment in a decent restaurant (we know it’s easy to resort to the fast food stand or conveniently-close-to-where-hunger-strikes-but-bland eatery, but don’t). And one that can stand in, with some panache, as a showcase for Slovakia’s culinary offerings. You will come across Hradná Hviezda in the stately cream-yellow courtyard buildings immediately on the west side of the castle (the side furthest away from the city centre, in other words). With a name translating as the Castle Star, it’s the sister restaurant of Modra Hviezda (Blue Star) a little further down in the Jewish Quarter near the Clock Museum – but it is the more dazzling of the two sisters. The setting exudes refinement, although inside, whilst the interior is pleasant enough with its walnut wood furniture and chandeliers, this is hardly what impresses. Nor is it the service (although, poised somewhere between the luke-warm and the congenial, the service is more than adequate). No, Hradná Hviezda will only have you planning your next visit back when you taste what it can do (cook well). There are seven or eight choices of typical Slovak main courses, and each whets the curiosity (and the palate). The meat, always soft, flavoursome and embellished by rosemary and thyme, is hardest to resist. There is the mangalica (the wild boar that roams in the forests above Bratislava) with a pumpkin sauce and chestnuts – chestnuts being a typical accompaniment to Slovakia’s game-centric meat dishes. There is a rabbit served with paprika sauce and dumplings – rabbit is a common meat for country folks who regularly go out bagging them but in Bratislava it is far rarer, and enhanced here by a combo of traditional Hungarian and Slovak sides, the paprika that sets Hungarian food a-blaze and the dumplings which prop up typical Slovak food. 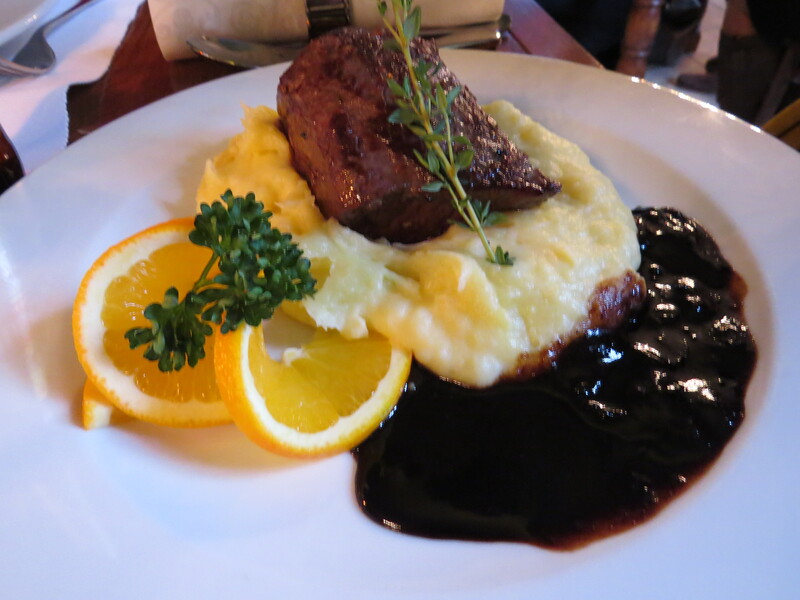 Jeleň (venison) is also offered – with the sauce concocted from Slovakia’s signature fruit, the plum, and a rich, creamy potato puree. But Hradná Hviezda also does a mean strapačky (dumplings with sauerkraut) and one that’s enticingly presented in contrast to the sometimes colourless versions of the dish served up elsewhere. Presentation (generous portions, yet thoughtfully arranged on the plates) is key with Hradná Hviezda’s food. The chefs clearly know exactly what they are doing. 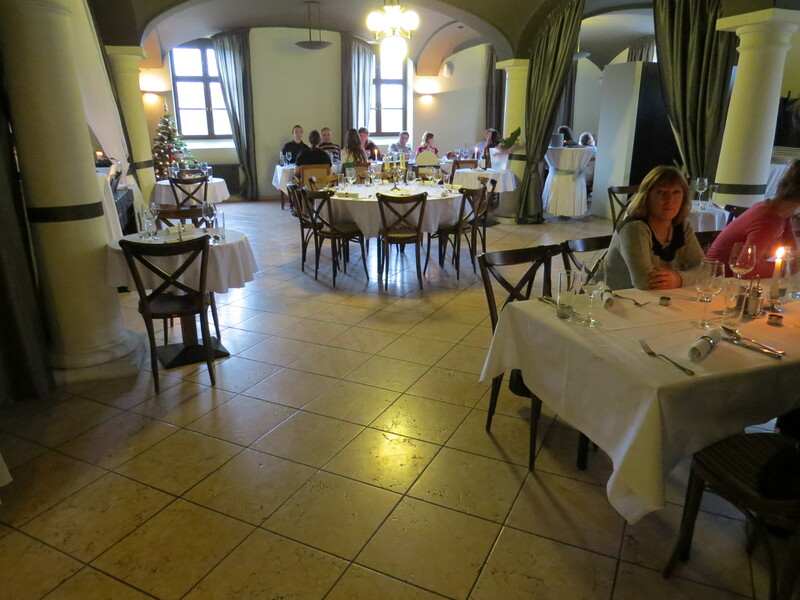 A meal here, consequently, is not cheap (mains are between 13 and 22 Euros, which puts it in a similar price bracket to one of our other favourite city centre Slovak restaurants, Traja Muškietieri). It would have been nice to wash down the delicious food with a choice of better Slovak beers (only offering Zlaty Bažant and Krušovice, two of the dullest beers in the country, is a definite shortcoming). It’s definitely recommended, therefore, to sample their wine list which in contrast goes overboard to offer a wide variety of Slovak wines. White wines in Slovakia, especially those from the Small Carpathians (Male Karpaty) Wine region, can rival the world’s best, and the dry white from Rulandske, in the Limbach/Pezinok region, is a true delight here. GETTING THERE: Directions are the same as for the castle, and this is an easy stroll up from the very centre, but for those with walking difficulties there is trolleybus 203, catch-able from Hodžovo námestie (and get out at the stop conveniently called “Hrad”). OPENING: 10am-10pm. Sometimes it can be a good idea to book – as the restaurant caters to tour groups (locals too, but also tour groups). BEST TIME TO VISIT: Oh, a dark wintry lunchtime when huddling by their cozy fireplace seems pretty much the best thing to do. Hradná Hviezda’s best dishes are the heavy, hearty, wintery kind. And a visit in out of the cold means the perfect excuse to sample one of their oh-so-typically Slovak fruit brandies… mahrulovica (with apricots), borovička (with pears). The list goes on. My ex-girlfriend always was a big fan of duck fat. She repeatedly told me lyrical, nostalgia-filled stories about what a great and delicious thing it was. My initial reaction was horror, followed by putting it down to a Slovak quirk. Let me contextualise: in Slovakia, loving duck fat is a pretty common thing. In the UK, duck fat prompts – well – largely disgust, right? After all, it’s the fat that’s left over from cooking duck. WHY ON EARTH WOULD YOU EAT IT when you could, er, throw it away? Well, for starters: just possibly we throw too much away in the UK. That’s despite the trend of all these restaurants that have as their speciality using the whole of the animal and not wasting any – yep, the nose to tail eating thing. Indigenous tribes across the globe thought of that idea long before anyway. And Slovaks are actually not too far behind. This, don’t forget, is one of the EU’s poorest countries and Communism bred a “waste not want not” approach out of pure necessity. So in Slovakia it has always made sense to keep your residue fat from when you are cooking meat: particularly duck and goose. But being British I have always had a bit of an obsession with marmite. If you want something savoury on your toast, this is the obvious choice, right? But not if you go gluten free in your diet, which I have recently done. Now, whilst having my gluten-free bread toasted in the morning, when I’ve already had a slice with jam, I’m looking for something savoury to round it off: so I reach for the jar of duck fat. I have been urged by Slovaks, many times, to try a bit – a tiny bit – on some warm toast, and I have to say I’ve finally acquired a taste for it. The taste. Yes. Basically, like a cross between a paté and marmite. Like a slightly meaty, slightly salty spread, a little crisp on the outside and buttery soft inside. My first reaction was that this was alright. My second was to have another lathering of it on another slice. And I’ve not looked back. Duck fat can be used for a number of things: including as a basis for cooking chips and the like. But in Slovakia perhaps the most common use is just as an alternative to butter. You have to have it melted on warm toast. If it’s not melted, it’s just not the same (although my ex is known to eat it by the spoonful from the jar). It’s also healthier for you than butter. And it tastes nicer. And it makes giving up marmite easier! For those of you looking for marmite when you come to Slovakia, it’s sometimes available in the big Tesco’s just down from Námestie SNP on Špitálska in Bratislava. Otherwise: get accustomed to the duck fat. *NB. 2016, autumn: Back on the marmite.Border line if it’s gluten-free or not anyway. But still loving the duck fat. But that’s because it’s made not with homemade plum jam like they use in a typical Slovak household, but sweetened stewed plums which, being chunky, rather dominate what’s underneath. However this traditional dumpling recipe is made with my ex-girlfriend’s mothers recipe which is far simpler than any of the other recipes out there on the web (at least those written in English). Rule number one. Dumplings in the English language is a term generally used to describe lumps of dough (potato or bread based usually) cooked invariably via boiling. Slovaks have a lot more terminology for dumplings, made with potatoes or even veal, and depending on size and shape as well as ingredients. But Šulance, the subject of this post, are small potato dumplings served sweet with butter, sugar and poppy seeds and for some reason (rather than waiting for my ex-girlfriend’s mum to make them) I decided to cook them for my parents this weekend back in England. 500 g potatoes and 180 g heavy (wholemeal is good) flour. Ample amounts of butter, icing sugar, poppy seeds/walnuts and plum jam/apricot jam. Boil the potatoes whole and with skins still on. Leave them to cool. They need to be cold when you start making the dough. Put the potatoes through a masher or roughly grate them and mix in the flour. For the dough, that’s it. Don’t add egg like all the recipes say. There’s no need. Season to taste with salt. You’ll want it more salty if you’re using this for savoury dumplings (yes this dough can magically be used for savoury or sweet) and less for sweet (šulance etc). However you WILL STILL WANT SOME SALT FOR ŠULANCE TOO! When a dough is formed, roll into several sausages and cut off portions (a few cm long and a couple of cm wide). In a big pan of slightly salted boiling water (yep more salt) and add the mini-dumplings one by one. When they start to rise (like with gnocchi) leave them stewing for about five minutes. Melt loads of butter in a pan and let the dumplings cool in the buttery mixture so they don’t stick. Cover with sugar. NOW. Apparently the proper serving method is with plum jam and poppy seeds OR apricot jam and walnuts. Being a man of excess, I used all four in liberal quantities – and it also tasted delicious. I would say make sure there are PLENTY of poppy seeds. This recipe turned out pretty much as good (taste wise) as you’ll get in a Slovak restaurant. I’m not boasting – it’s just quite easy to make, but fairly time consuming, what with the dough rolling etc.